Will pick a winner next Thursday!! Would love to rey this new product and as always will leave a review/feedback as requested. 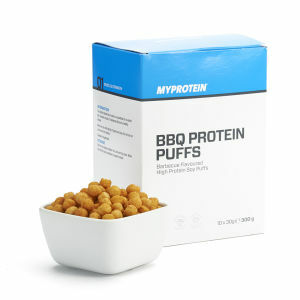 As these winter nights draw in I'd be more than happy to sit back and pass my time snacking some BBQ protein puffs with a view to providing some feedback. Thanks for your interest Oldy, Kaneda and GoodIntentions. Please PM me your address details and i'll arrange for these to be sent out! Ok thanks noob17 and Redwing! PM me your details please and i'll get them forwarded for shipment! That's the 5 samples gone now! Thanks for your interest guys and looking forward to your reviews! Like crisps with protein? I would eat these like a tub of popcorn!!! I'm defiantly interested in trying these. Putting my name forward mainly because I'd like to see if they top the smoothies..
Or maybe I'm too late. Sorry guys, the 5 boxes have already been allocated (see above) but check back again for future product samples. I haven't actually received anything in the post. Anyone else got theirs? Not received mine yet either. Hi guys, I believe these have now been sent out. Looking forward to trying these and posting a review.